In graph theory, the degree of a vertex is the number of connections it has. For example, the vertices of the below graph have degrees (3, 2, 2, 1). It is easy to determine the degrees of a graph’s vertices (i.e. its degree sequence), but what about the reverse problem? Given a list of integers, how can we construct a simple graph that has them as its vertex degrees? Does such a graph even exist? 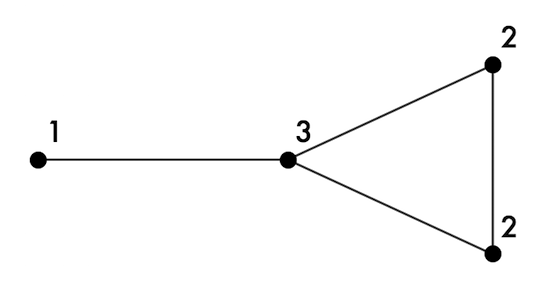 This blog post deals with a special case of this problem: constructing connected simple graphs with a given degree sequence using a simple and straightforward algorithm. IGraph/M is a Mathematica package for use in complex networks and graph theory research. It started out as a well-integrated Mathematica interface to igraph, one of the most popular open source network analysis packages available. In addition to exposing igraph functionality to Mathematica, the current version of IGraph/M contains many other functions for working with graphs. September 2015 update: If you are looking to use igraph from Mathematica, also take a look at the work-in-progress project IGraph/M. I now recommend using IGraph/M instead of IGraphR except when it does not yet have the functions you need.